A Church of England bishop has lashed out at evangelicals who support the Trump administration, as he launches a new charity that will campaign for LGBT inclusivity. The Bishop of Liverpool, the Rt Revd Paul Bayes, made the comments as he was named Chair of the Ozanne Foundation, a new charity that will work with religious organisations around the world to eliminate discrimination based on sexuality or gender. The new foundation has been set up to help educate and advocate on LGBTI and gender rights around the world, particularly within religious organisations that are opposed to non-heterosexual relationships. In addition, it will look to foster good relations inside religious organisations that hold conflicting views on sexuality and gender issues. Speaking about his decision to chair this new foundation, the Rt Revd Paul Bayes said: “The Church of England has committed herself to what our Archbishops have called radical new Christian inclusion, and has publicly stated that we are against all forms of homophobia. “If we mean this, and I believe we do, then we need to find appropriate ways of welcoming and affirming LGBTI people who want their love recognised by the Church. In an interview with the Guardian, the Bishop contrasted his views with those of evangelical Christians in the US who have backed the Trump administration as it aims to undermine LGBT rights protections and broader equality. He said: “People who call themselves evangelical in the US seem to be uncritically accepting [of Trump]. He added: “Some of the things that have been said by religious leaders seem to collude with a system that marginalises the poor, a system which builds walls instead of bridges, a system which says people on the margins of society should be excluded, a system which says we’re not welcoming people any more into our country. Evangelical leaders such as Franklin Graham and Tony Perkins were influential in building support for the Trump campaign, and right-wing Christian lobbying groups have been a crucial factor in the Trump administration’s shift against LGBT rights. Meanwhile, the Ozanne Foundation will work to build a movement for LGBT equality within the Church. Bishop Paul chairs an influential group of ten trustees from across the church traditions, which range from the Dean of St Paul’s, the Very Revd David Ison, to the Editor of the Church of England Newspaper, Colin Blakely. A Council of Reference brings together some of the most outspoken names on LGBTI rights within the Christian Church – including Revd Steve Chalke of the Oasis Foundation, the Very Revd Prof Martin Percy, Dean of Christ Church, Oxford, Labour MP Ben Bradshaw and the Dean of St Albans, the Very Revd Jeffrey John. The Charity’s Director, Jayne Ozanne, is a well-known activist within the Church of England. Based in Oxford, Ms Ozanne previously she led a Private Member’s Debate in the General Synod that resulted in the Church of England calling on the government to ban Conversion Therapy. She said: “I am thrilled that so many personal friends have felt moved to come together to support my work, and am excited about what this new opportunity might mean. 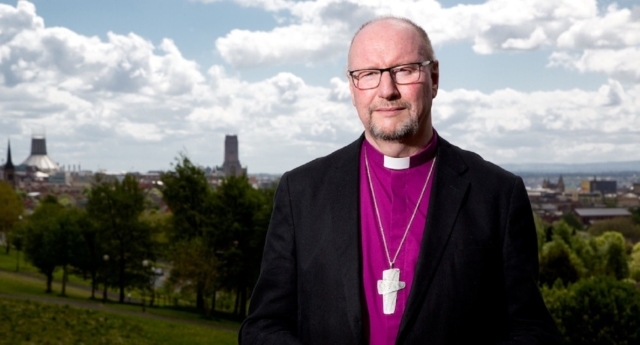 The Bishop of Liverpool, an outspoken supporter of LGBT equality, recently became a patron of his local Pride event. The church leader is a strong proponent of LGBT rights, supporting equal marriage and backing a recent motion calling for a ban on gay ‘cure’ therapy. In a statement, the Bishop referenced the homophobic murder of local gay teen Michael Causer. The Bishop said: “Ever since the tragic death of Michael Causer, Liverpool Pride has stood for the struggle for justice as well as the celebration of LGBTI+ life in our city and region. “I am privileged to identify with Pride’s contribution to tackling prejudice and promoting awareness of the richness of our LGBTI+ community. “As a Christian, I really believe that Jesus wants a community where all are included and free from fear. “Now we all know that the Christian church in general, and the Church of England as part of that, can get itself into a twist over inclusion and equality issues. I myself have been advocating in the church for LGBTI+ inclusion, and all Christians have to agree that homophobia and hate crime are evil and are to be resisted. “At the recent meeting of our General Synod the Church of England made some clear and positive statements resisting so-called conversion therapy and exploring services of welcome for trans people who want their true identity to be recognised before God. The Bishop recently admitted that some of his ultra-conservative colleagues refuse to be in the same room as him. Rt Rev Paul Bayes wrote in a blog post: “My own experience, since I began speaking out for the beginnings of change in the Church, is that I am profoundly suspected by many who disagree with me and that indeed some of them cannot in conscience remain in the same room as me, or work with me.